Contact Details : Contact Sri.NTR Rajasekhar, DGM, Mobile No. 9100072161 or Sri.Sarveswara Rao, CM-9959988571, Sri.L.B.Srinivas, Manager, 8885581120. 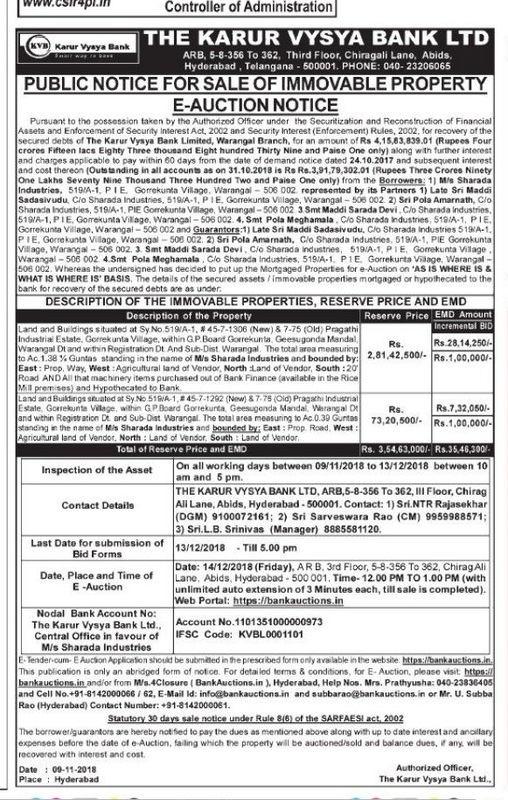 Inspection Details : For Inspection Details Please Contact Sri.NTR Rajasekhar, DGM, Mobile No. 9100072161 or Sri.Sarveswara Rao, CM-9959988571, Sri.L.B.Srinivas, Manager, 8885581120, Inspection Of Assets On All Working Days Between 09.11.2018 To 13.12.2018 Between 10:00 AM and 05:00 PM.